There is a fair collection of machines lives at chez Andsewtoknit, my idea is that everyone should have the chance to sew on as many different machines as possible, variety is good. 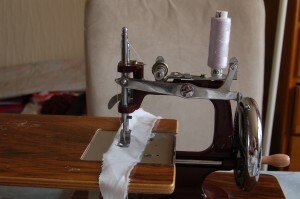 There are a ton of very serviceable, useable machines around, these do tend to be on the very heavy and not very portable side, but with a little tlc they for the most part sew basics beautifully. I admit to not being a fan of the new and shiny, I am a vintage girl at heart and love nothing more than finding an old machine that needs a good clean up. While out and about trailing charity and secondhand shops the other day, I came across this little pretty thing. I have never seen anything like it and didn’t buy it to begin with, its an Essex toy hand-crank and works with no bobbin to give a continuous locking stitch, it hasn’t been cleaned yet but sews lovely, perfect for little people to have a go on. It will be around at the café purely for the novelty factor, will be fun to see how many people just can’t resist a wee shot. First sewing session at the café is on Tuesday 15th 12.30-3.30 machine rental booking being taken now, call or email or comment here and I will get back to you, happy sewing.